Dine by Donation is back in 2017. Merediths' Charity for November is VOSO. We are the last charity for 2017 and before Michael Meredith sells. Merediths is fully booked for VOSO and we are very excited to be returning. 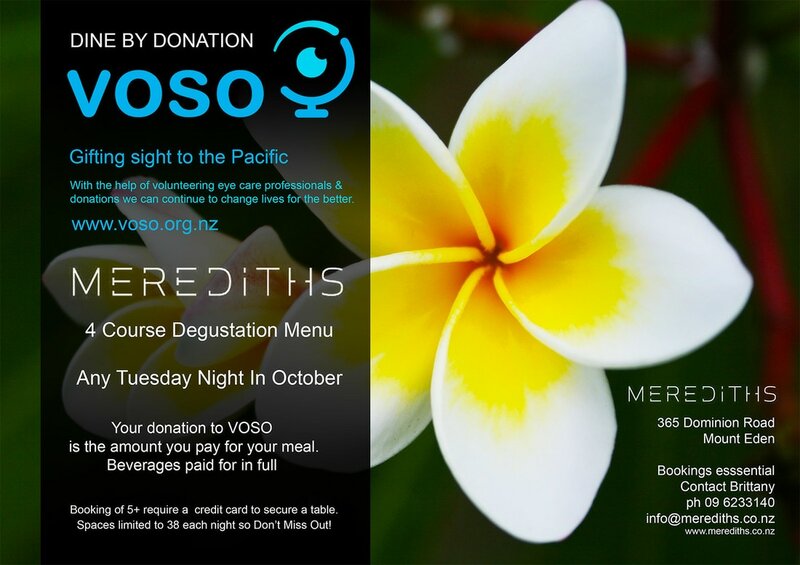 In October 2016 VOSO was Merediths' Charity for Dine By Donation. VOSO was blown away by the support of Michael Meredith, his team and all those that came along and dined. VOSO raised over $10,700! Never before had VOSO done a fund raising event, or ever received such a figure in donations. Bula Andrew and Jesse, on behalf of this hospital and the staff especially the ones at the Eye Department, I would like to say ‘Vinaka ‘ for your continuous support to this hospital and this department. Please convey a warm appreciation to the VOSO NZ team at home and all the wonderful supporters of our hospital out there in NZ. We cannot repay you for all these but we will always pray for God’s grace on all of you.